The president announces $US 1.2 billion for those affected by severe weather now and proposes $US 1 billion more for adaptation and research. 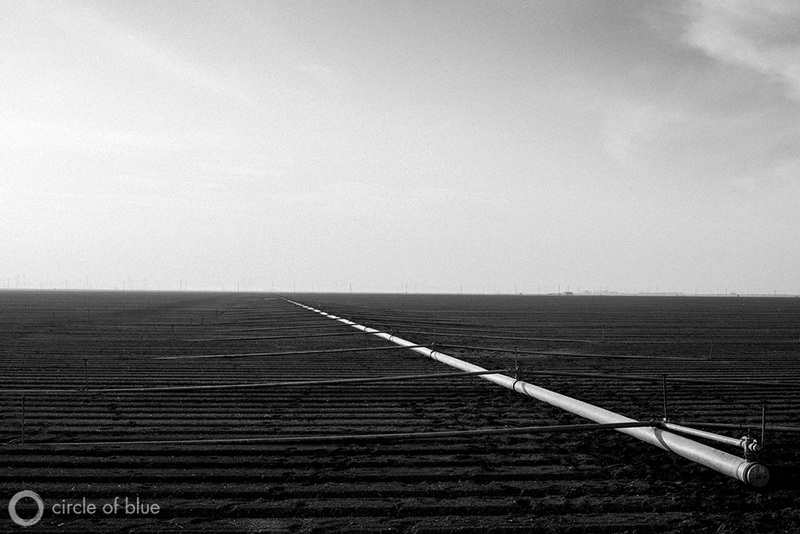 Irrigation pipes in the Westlands Water District, home to some of California’s largest farms. Growers in the area have seen their water supply cut in recent years, leading to calls to construct a new tunnel system to deliver more water from the California Delta. Click image to enlarge. Acting on climate change and the growing toll it’s taking on U.S. agriculture, President Obama today will announce a $US 1.2 billion aid package for farmers, ranchers, and communities in California and several more agricultural states pummeled by a series of devastating droughts and snowstorms in the past year. The president also will make public a climate-related item in his 2015 budget weeks before its March due date, a proposal to spend $US 1 billion more for a climate resilience fund. The money will facilitate research, data collection, and the development of new technologies and infrastructure that will help the United States adapt to stronger storms, longer droughts, and rising seas caused by climate change, according to a briefing by top administration officials. Senior Obama administration officials said the president will announce both measures during his stop this afternoon in Fresno, California, a farming city of more than 500,000 residents and the epicenter of a three-year drought that is deepening in the nation’s largest state. The direct $1.2 billion federal drought aid will be available for California, and for states in the Great Plains and the Midwest, said the administration. The aid package and the climate fund reflect the growing cost of natural disasters – $7 billion in 2013 alone – and the important role the federal government has been playing to help residents in rural communities cope with increasingly erratic weather. Most of the money in the 2014 drought disaster package will be claimed by cattlemen whose livestock were killed, whose herds were reduced by bad weather. “We’re going to send a message to California producers that we’re here to help as best we can,” said U.S. Agriculture Secretary Tom Vilsack during a conference call previewing the presidential visit. By choosing Fresno as the site of his announcement, President Obama is placing himself in the center of California’s poorest, most vulnerable region. Farmers in the Central Valley, the heart of the state’s $US 44 billion agriculture industry, will leave fallow in 2014 a patch of land half the size of Rhode Island during what scientists say is one of the worst droughts in California in the last 500 years. Unemployment is rife in the valley – an area with nine of the 17 highest metropolitan unemployment rates in the nation – and without fields to tend, many more farmworkers are likely to be jobless. Ranchers, too, have been hit hard. Pastures have turned brown and herds have been culled. The president will make available $US 1 billion in cash to livestock producers. The administration expects producers in California to claim $US 100 million. The rest will go to ranchers in the Dakotas who lost at least 43,000 cattle in an October 2013 blizzard and to ranchers in the Great Plains, where a record-setting drought in 2012 caused the U.S. cattle herd to fall to its lowest level since 1952. One of the conditions in the package is a quicker aid application process. The president wants to cut processing time from 8 months to 60 days. $US 15 million in conservation grants made through the Environmental Quality Incentives Program, a program that targets water and soil conservation and access to water for livestock. Two-thirds of the money will be distributed to Colorado, Oklahoma, Nebraska, New Mexico, and Texas. The balance will go to California, which is in addition to $US 20 million the president made available to the state earlier in February. $US 5 million for the Emergency Watershed Protection (EWP) Program, to be used in California to stabilize stream banks and prevent erosion. $US 60 million will be made available to food banks in the State of California to help families that may be economically impacted by the drought. $US 3 million for rural communities at risk of running out of water. The California Department of Public Health has identified 17 such systems. The federal aid package also directs a handful of U.S. agencies – Bureau of Reclamation, Environmental Protection Agency, Interior Department, U.S. Fish and Wildlife Service – to speed up approval for projects that would alleviate water quality or water quantity problems. It was not immediately clear which projects the order referred to. During his brief time in the Central Valley, the president will participate in a roundtable discussion with community leaders in Firebaugh, 45 minutes west of Fresno. Before returning to Air Force One, he will tour a farm in nearby Los Banos. “The president will offer a message of hope, a message that the federal government will do all it can to help with this drought,” said Vilsack, who will accompany the president on the trip.